Sandra McFarlane, Dorothy Skeoch, Deacon Convener Dr. Alastair Dorward, Jinty Rodger and Moira Allan. 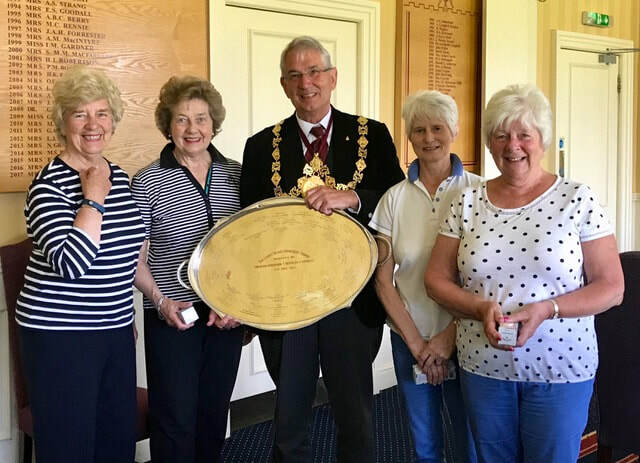 The Merry Mason's ladies golf team have achieved great success at this year's golf competition, beating all comers from the other Incorporations to win the Trades House Ladies Golf Championship. The competition took place at Douglas Park golf course where all tams were well looked after. The photograph to the left shows Deacon Convener Dr. Alastair Dorward presenting the ladies with the silver salver. The Deacon and Master Court sent their congratulations and best wishes to this fantastic team.